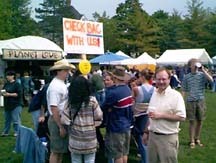 Students from the 1998 Spring class of "Alcohol Use and Abuse" course participated in a survey of student blood alcohol levels (BAC) between 2:00 and 4:00 pm on Saturday May 9 at the Hobart and William Smith CollegesFolk Fest. A summary of the results from 111 BAC tests are show below with some photographs of the action. 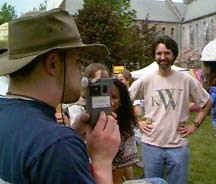 The booth was very popular and had a crowd around it for the full time it was open. A total of 111 people had their BAC tested. 21 (19%) had some alcohol in their system but below 0.08 BAC. This is lower than the DWAI limit. 11 (10%) were above the 0.08 bac level (8 males and 3 females).